Australian avant – grindcore pioneers Beyond Terror Beyond Grace are set to tour Europe/UK for the first time in support of the mighty Cattle Decapitation and Gorod, including a debut performance at the Obscene Extreme Festival. The band’s latest offering ‘Our Ashes Built Mountains’ was released in February on Obscene Productions (EU) and Deepsend Records (US), and sees the band deliver a scathing mixture of ferocious blackened grindcore and swirling atmospherics, expanding on the extreme metal genre and creating a sound that is uniquely their own. After some massive Australian performances alongside bands such as Carcass, Pig Destroyer, Behemoth, Grave, Brutal Truth, Obituary etc, and a full Australian tour supporting Ulcerate (NZ) in February, the band is well and truly ready to dumbfound and destroy audiences across Europe and the UK. ‘To say that we’re excited about the prospect of hopping aboard a giant bus and playing shows around Europe with such an influential band is a massive understatement. When a band from such an out of the way part of Australia is offered the opportunity to tour with Cattle Decapitation and play Obscene Extreme it is a massive privilege, and we feel very lucky indeed. See you guys at the shows!’. In 2004 Beyond Terror Beyond Grace began with only one goal in mind which was to devastate audiences and listeners with an inhuman sonic assault in the vein of Nasum, Rotten Sound, Converge and Napalm Death. Fast forward over the last 5 years having played countless shows across Australia and New Zealand alongside some of the biggest names in the metal word in support of their acclaimed debut album "Extinction|Salvation", the band is now ready to unleash their new album "Our Ashes Built Mountains". "Our Ashes Built Mountains" is a new beginning. Traversing the grinding punk energy of "Flightless", blackened atmospherics of "Husk", the blastbeat driven fury of "Aesthetics" to the abrasive "Paradigm" and ambient "Murakami", "Our Ashes Built Mountains" is a diverse ferocious fusion of blistering speed, spine snapping riffs, disturbing dissonance and unbridled intensity backed by unsettling atmospheric undertones. 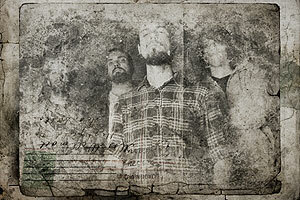 Containing 20 tracks and featuring guest appearances by Jason Peppiatt (Psycroptic), Jarrod Krafcyk (ex-The Amenta/The Riot and the Trauma/Anchored Awake), Alex Pope (Ruins), Anna Vo (Crux), Blake Simpson (Gallows for Grace) and Tim Pope (The Amenta), "Our Ashes Built Mountains" reflects a band refining and merging its original explosive intent with ambition and adventurousness that is unparallelled in the extreme metal/grindcore genre. Combined with dense production courtesy of Tim Carr (Studios 301 Sydney) and epic artwork by Colin Marks (Strapping Young Lad, Whitechapel, Aborted, Suicide Silence), "Our Ashes Built Mountains" is intense, furious and emotive, and a knife through the heart of musical and lyrical inertia. Over the years we have been fortunate enough to share the stage with many amazing overseas and Australian bands. These include: Carcass , Behemoth , Pig Destroyer , The Black Dahlia Murder , Cephalic Carnage , Brutal Truth , Obituary , Psycroptic , The Amenta , Kataklysm , Blood Duster , Grave , Ulcerate , Extortion , Skinless , The Berzerker , The Red Shore , Ruins , For the Fallen Dreams , Wolves In The Throne Room etc. 2010 "Our Ashes Built Mountains"